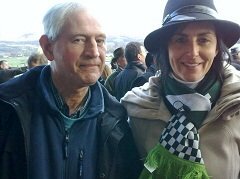 At the Cheltenham Festival - Don't follow the crowd just follow the trends! However Tanya Stephenson of Channel 4 Racing is certainly worth following and I was lucky enough to catch up with her at the trials. 2016 Festival News: Annie Power on come back trail. AGE 35 of last 39 races won by either a 5 or 6 year old. Form Most came 1st or 2nd last time out. Finished in first 2 on any completed chase start that season in GB or Ire. BREEDING 3 mares have won this in 87 years. Form Most will have won over at least 2m4f if tried at the trip. Will not have finished outside the first 4 in any completed hurdle races. Has been placed in a graded race. Challow winners have a poor record. No winners wearing headgear. Previous Champion Bumper contestants who finished in the first 6. Won a novice hurdle at Cheltenham this season. TRAINERS Irish trained will be placed at least. Possible winners this year are Ballycasey, Don Cossack or Carlingford Lough. Not run in past 27 days but had a run this year. Paul Nicholls has won twice. Form Most Will have finished 1st or 2nd last time out. Won a graded chase over 2m5f or chase over 3m. Run between 3 - 5 times over fences. Will not have finished outside the first 3 in any completed chase. RATINGS Has a hurdle rating of at least 134. Will have won a listed hurdle. Form Will have won this season and come 1st or 2nd last time out unless failing to complete. Won a grade 2 chase. Had no more than 4 runs this season. Will have won 1/2 of all NH starts and had at least 7 runs over fences. RACES 22 from last 29 won or placed at Cheltenham Festival before.